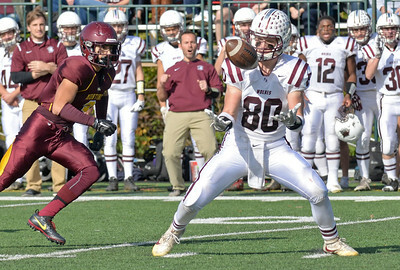 Bill Ackerman - For Shaw Media Prairie Ridge's Austen Ferbet (80) intercepts a Montini pass in a second round 6A football playoff game in Lombard on Saturday, Nov. 5, 2016. Prairie Ridge holds a 42-10 lead at halftime. 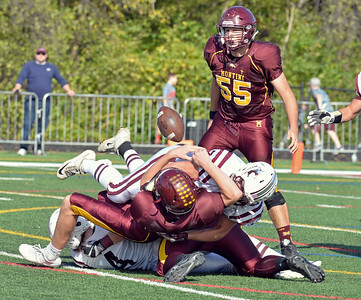 Bill Ackerman - For Shaw Media Prairie Ridge quarterback Samson Evans scores his second touchdown against Montini in a second round 6A football playoff game in Lombard on Saturday, Nov. 5, 2016. Prairie Ridge holds a 42-10 lead at halftime. 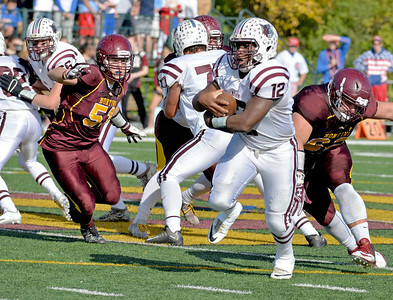 Bill Ackerman - For Shaw Media Prairie Ridge's Emmanuel Ebirim runs the ball on a handoff against Montini in a second round 6A football playoff game in Lombard on Saturday, Nov. 5, 2016. Prairie Ridge holds a 42-10 lead at halftime. 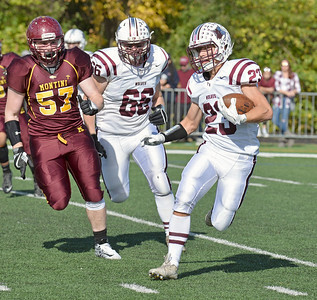 Bill Ackerman - For Shaw Media Prairie Ridge's Cole Brown runs the ball against Montini in a second round 6A football playoff game in Lombard on Saturday, Nov. 5, 2016. Prairie Ridge holds a 42-10 lead at halftime. Bill Ackerman - For Shaw Media Prairie Ridge's Jacob Ommen knocks the ball loose on a quarterback sack against Montini in a second round 6A football playoff game in Lombard on Saturday, Nov. 5, 2016. Prairie Ridge holds a 42-10 lead at halftime. 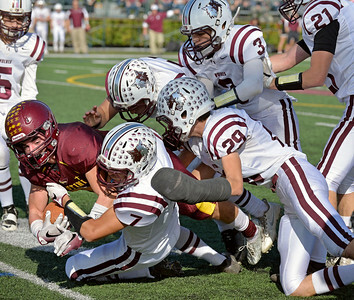 Bill Ackerman - For Shaw Media Prairie Ridge's Daniel Renteria (7) and Pete Berg (29) tackle Montini's Brendan Rauen on a pass play in a second round 6A football playoff game in Lombard on Saturday, Nov. 5, 2016. Prairie Ridge holds a 42-10 lead at halftime. Prairie Ridge quarterback Samson Evans scores his second touchdown against Montini in a second round 6A football playoff game in Lombard on Saturday, Nov. 5, 2016. Prairie Ridge holds a 42-10 lead at halftime.